I recently read an article about a “Healthy Food Zone” ordinance possibly being put in place in Austin, Texas for 2016. Fast food restaurants and other retailers of unhealthy food options would be banned from opening in areas surrounding Austin schools, parks, recreation centres, libraries, and child care centres in an effort to fight childhood obesity. Although probably very difficult to put in place, I found this to be a very interesting idea. How would this impact students and schools? Would it be beneficial? Should we be thinking about implementing a similar plan here in Canada? The Guidelines for Food and Beverage Sales in BC Schools was implemented a year or two into my time in high school. I was able to see the change first hand and experience its impact on the school and students. Ketchup chips were replaced with apple chips and those big chewy chocolate cookies were gone from vending machines forever. It didn’t take long before students started to flock to the nearby Safeway, A&W, and gas station convenience store during their lunch hour. I was quite upset about the missing cookies, but of course now I see it differently. Although I think the “Healthy School Zone” concept is a good idea, I don’t think that just removing the so-called culprits will solve the problem. Students have found a way around it before and they will most likely find a way around it again. A healthy school isn’t just about a healthy classroom; a healthy school is defined by the whole school environment. The Comprehensive School Health framework defines this whole school approach with four inter-related pillars; relationships and environments, teaching and learning, community partnerships, and our school policies. When actions are taken across all four pillars, there is a greater impact on the health of students, the school, and the community. I believe that for this “Healthy School Zone” concept to work, all four pillars will need to be looked at. Simply just taking away the options will most likely have a negative impact. We all have the tendency to want what we can’t have right? Students, staff, and parents should fully understand why the change is necessary, why healthy eating is important, and what benefits are associated with it. They should also be able to take part in the discussion, share their opinions on the subject matter, and ask questions. Perhaps a school policy should be put in place with regards to healthy eating. Also, possible partnerships could be made with restaurants and retailers to sell healthier food options. Students should be given the opportunity to learn about the health benefits of healthy eating so that they can make informed food choices themselves, better educated students are healthier and healthier students learn better. If everyone is involved in the process, a change is more readily accepted. When does a badger hole contribute to the healthy development of children? There is a growing body of evidence that connects healthy child development and exposure to nature. Never was this truer than at Chief Matthews School in Old Masset, Haida Gwaii where students and the school community have a vision for a natural playground and nature trail at their school. You could not find a flatter playground than the one at Chief Matthews School, on a flood plain at the top of Graham Island. It is here, where the nursery to grade 4 students were asked: “what would you like to see in your playground space?”, the overall consensus was a grassy hill and a nature trail. To support their interest, Principal Lesley Bellis submitted an inquiry question to the Healthy Schools Network with two components; how could we better serve students’ healthy exercise needs as well as teach them about their relationship with the natural world and their cultural history? 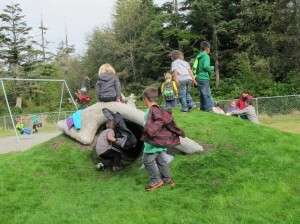 With load after load of dirt, a long piece of corrugated plastic pipe with a large enough circumference for students to climb through, drift wood collected from the nearby beach and grass seed, and parent helpers, a natural playground began to take shape. This is where I come in, a well-timed visit to Haida Gwaii to learn more about rural, remote students and schools finds me in Old Masset the week after their natural playground and nature trail completes. I had heard through the Healthy Schools Network of this inquiry project, and I wanted to see first-hand the outcome of their work. As soon as I arrive at the school, it’s pretty obvious what they want me to see. There are a number of students scurrying around, climbing, rolling and running over and through a newly planted grassy hill. Thankfully, I don’t need to climb through; it’s only the right size for students. After a short while I’m asked, “Would you like to take a walk through our nature trail?” “Of course”, I reply. Did I realize how much up and over was going to be involved in a nature trail? Definitely not! Better serving the needs of everyone’s healthy exercise, including mine was definitely achieved. Later when I made a visit inside to the Grade 3 classroom, one little fellow pipes up, “Did you like our new badger hole?” With a big smile I reply, “Yes indeed”. Thanks to the student volunteers who provided me with a guided tour and thank you to Chief Matthews School for a fun filled visit to their natural playground or perhaps better called, badger hole! To learn more about the health benefits for children through contact with nature and the outdoors visit the Children and Nature Network. I gave a second thought to what it means to be healthy as a result of my recent visit to Haida Gwaii. I went with the intention to learn more about rural, remote student and school experiences, but I came back with so much more. I’ve always felt quite grounded in my understanding that health is a resource for living; however the concept that my language supports me to be a healthy individual had never entered my mind. That’s not the perspective Erica, Jay, Brenden, Ryan and Albert in the SHIP program hold. 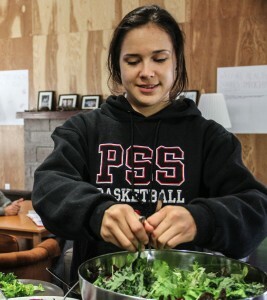 Their language is vitally important to their sense of who they are, so much so they are interns at HLGAAGILDA XAAYDA KIL NAAY, or in English SHIP, the Skidegate Haida Immersion Program. 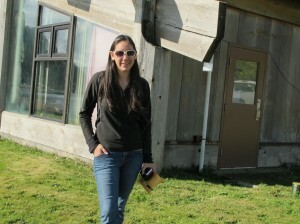 They believe that when they speak the Haida language, they know they are Haida. An inspiring pride sweeps over their faces. An opportunity to hear their experiences as interns at SHIP added to my understanding of what life is like in remote Haida Gwaii. I learned being in nature calms hearts, and that there are unlimited opportunities to be outside, where they desired to be. SHIP provides powerful experiences in reciprocal relationships, supporting them to make valued contributions to their community. Erica talked openly of her desire to complete her teaching degree so she could support aging elders, who literally wear themselves out visiting local schools to speak their language. Erica looks forward to her future when she can help out and make significant contributions as a teacher in her community. And finally, they shared that the very act of taking the time to have a conversation with them demonstrated I was interested in more than just what I could see, reminding each of them of similar experiences connected to pivotal points in their lives. Why is DASH committed to supporting all learners to be healthy, engaged and connected to their communities? Being healthy, engaged and connected adds powerful meaning and purpose to a person’s day to day activities. One’s health is truly a valuable resource for everyday living.